One of the men charged with murdering prominent loyalist George Gilmore must remain in custody, a judge has ruled. Brian McLean, 35, was refused bail despite his lawyer challenging the reliability of key prosecution witnesses. McLean, from The Birches in Carrickfergus, allegedly lured the victim into a deadly trap during a paramilitary conflict in the Co Antrim town. 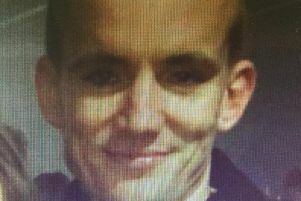 Gilmore, 44, died after being hit by bullets fired at his car on the Woodburn housing estate in broad daylight on March 13. He had been goaded into chasing his alleged murderers, detectives claim. The attack was part of a year-long dispute between Gilmore’s grouping and the UDA’s south east Antrim unit said to have cost £1m to police. McLean is charged with murder along with the alleged gunman, 28-year-old Samuel David McMaw, of Starbog Road in Kilwaughter. Both men face further counts of attempting to murder two of Gilmore’s associates and possessing a firearm and ammunition with intent to endanger life. They deny all the offences. His son, George Jnr, was said to be travelling in convoy in a second vehicle. Two men, allegedly identified by witnesses as McMaw and McLean, were spotted standing in the Cherry Walk area. Prosecutors claim they began shouting and making hand and arm gestures in a bid to provoke the Gilmores into a pursuit. McMaw was then allegedly seen crouching down in an alleyway, attempting to pull a balaclava over his face and brandishing a gun. As Gilmore tried to speed off seven shots were fired from a 9mm pistol. One bullet went through the windscreen, striking and fatally wounding the loyalist. His car continued on, mounting a pavement before crashing into a wall. McLean is charged with the murder on a joint enterprise basis. At Belfast Magistrates’ Court on Thursday his solicitor, John Greer, mounted a fresh application for bail based on previous allegations made by prosecution witnesses. He argued that five other men they made kidnapping and false imprisonment accusations against were never arrested. Suggesting police must have considered their accounts unreliable in that case, Mr Greer questioned why a different view was being taken over the Gilmore shooting. But District Judge Liam McNally ruled that bail should be denied. He indicated the issue could be raised again at the High Court.